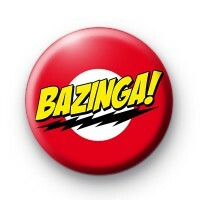 Bazinga badge From the Big Bang Theory. Bright red badge with bazinga written across it. A Sheldon Cooper inspired Bazinga badge. We love the big bang theory and sheldon cooper so we made this sheldon cooper badge in his honour. Sheldon is an astrophysicist living with his room mate leonard hofstadter and hanging out with Penny, raj and howard. A superb the big bang theory badge.